The given table shows the five different boxes contain three different color balls. 1. Probability of drawing one blue from box E is 1/4 and the probability of drawing one red ball from box E is 2/15. The probability of drawing one yellow ball from box D is 5/12. Find the sum of the probabilities of drawing one yellow ball from box E and one red ball from box D? 2. The probability of drawing one yellow ball from box A is 2/7. Probability of drawing one red ball from box B is 3/10. Find the sum of the probability of drawing 2 blue balls from box A and the probability of drawing two yellow balls from box B? 3. If the probability of one red ball drawing from box A is 1/3 and the probability of drawing either a Yellow or Red ball from box C is 4/5, and then find the difference between the probability of drawing 2 balls from box A such that both balls are either yellow or Red and the probability of drawing three balls from box C such that 2 of them are blue balls and one of them is red ball? The probability of drawing a Yellow ball from box E is 2/15 and the probability of drawing a blue ball from box E is 1/5. Quantity I: The number of total balls in Box F is 5/6 times the total number of balls in Box E. The number of red balls from box F is 6 less than the number of Yellow balls from box F and the number of Blue balls from box F is 2/3 times the number of blue balls in Box E. Find the number of red balls in Box F? Quantity II: The number of Red balls in Box G is 9 more than the half of the total number of Red balls in E. The number of Yellow balls from box G is same as the number of yellow balls in Box D. The probability of drawing a blue ball from box G is 11/70. Find the number of blue balls in Box G? Quantity I = Quantity II (or) Relationship cannot be determined. 5. The probability of getting one blue ball from Box A is 3/20 and the probability of getting one red ball from box D is 3/10. Total number of balls in Box A is what percentage more/less than the total number of balls in Box D? 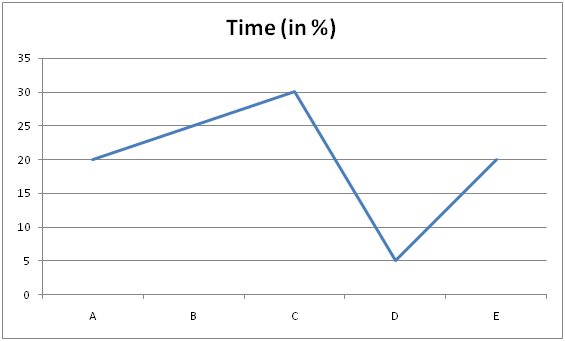 Direction (6 - 10): Study the following information carefully and answer the given questions: The given line graph shows the percentage of time taken by five different cars in the journey. Total time taken in the journey= 60 hours The given table shows the distance covered by car. 6. If the train crosses the car A running in the same direction in 36 seconds and the same train crosses the car E running the opposite direction in 6 seconds. Train runs at the speed of 60 kmph and also crosses the pole in 9 seconds. What is the difference between the distance covered by car A and car E? 7. A train running at the speed of 72 kmph crosses another train in opposite direction at 54 kmph in 12 seconds. The first train crosses the 260m long bridge in 20 seconds and the second train crosses car C running in the opposite direction in 6 seconds, then find the distance covered by car C? 8. A train can travel 50% faster than a car A. Both start from Chennai at the same time and reach Bangalore 150 km away from Chennai at the same time. On the way, however, the train lost about 25 minutes while stopping at the stations. If the speed of Car A, Car C and Car E in the ratio of 6:4:3 then find the average of the distance covered by all the five cars together? 9. The sum of the speed of car B and car D is what percent of the distance covered by car C, if the speed of car C is 40kmph? 10. If the total distance covered by all the car is 1350 km and the distance covered by car A, car C and car E in the ratio of 2 : 3 : 1. What is the average speed of all the cars together? 1) Probability of drawing one blue from box E is 1/4 and the probability of drawing one red ball from box E is 2/15. The probability of drawing one yellow ball from box D is 5/12. Find the sum of the probabilities of drawing one yellow ball from box E and one red ball from box D? 2) The probability of drawing one yellow ball from box A is 2/7. Probability of drawing one red ball from box B is 3/10. Find the sum of the probability of drawing 2 blue balls from box A and the probability of drawing two yellow balls from box B? 3) If the probability of one red ball drawing from box A is 1/3 and the probability of drawing either a Yellow or Red ball from box C is 4/5, and then find the difference between the probability of drawing 2 balls from box A such that both balls are either yellow or Red and the probability of drawing three balls from box C such that 2 of them are blue balls and one of them is red ball? 4) The probability of drawing a Yellow ball from box E is 2/15 and the probability of drawing a blue ball from box E is 1/5. e) Quantity I = Quantity II (or) Relationship cannot be determined. 5) The probability of getting one blue ball from Box A is 3/20 and the probability of getting one red ball from box D is 3/10. Total number of balls in Box A is what percentage more/less than the total number of balls in Box D? The given line graph shows the percentage of time taken by five different cars in the journey. 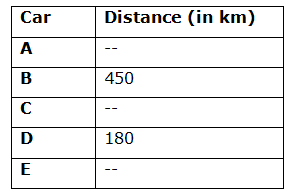 The given table shows the distance covered by car. 6) If the train crosses the car A running in the same direction in 36 seconds and the same train crosses the car E running the opposite direction in 6 seconds. Train runs at the speed of 60 kmph and also crosses the pole in 9 seconds. What is the difference between the distance covered by car A and car E? 7) A train running at the speed of 72 kmph crosses another train in opposite direction at 54 kmph in 12 seconds. The first train crosses the 260m long bridge in 20 seconds and the second train crosses car C running in the opposite direction in 6 seconds, then find the distance covered by car C? 8) A train can travel 50% faster than a car A. Both start from Chennai at the same time and reach Bangalore 150 km away from Chennai at the same time. On the way, however, the train lost about 25 minutes while stopping at the stations. If the speed of Car A, Car C and Car E in the ratio of 6:4:3 then find the average of the distance covered by all the five cars together? 9) The sum of the speed of car B and car D is what percent of the distance covered by car C, if the speed of car C is 40kmph? 10) If the total distance covered by all the car is 1350 km and the distance covered by car A, car C and car E in the ratio of 2 : 3 : 1. What is the average speed of all the cars together?